Following a strike-interrupted regular season, two teams with 5-4 records met in a NFC First Round playoff game in Minneapolis on January 9, 1983. The 57-day work stoppage had limited the 1982 NFL season to nine games, resulting in the league eliminating divisions and having the top eight clubs in each conference make the playoffs. Minnesota was the fourth seeded team and Atlanta ranked fifth. While the Vikings were coached by Bud Grant for the 16th season, there was a significant change in terms of venue. Rather than being a rugged outdoor team that made the most of cold conditions at old Metropolitan Stadium, especially in the postseason, Minnesota had moved into the domed confines of the Hubert H. Humphrey Metrodome, which took the elements out of the equation. Still, they had won four of their five games at the new stadium. 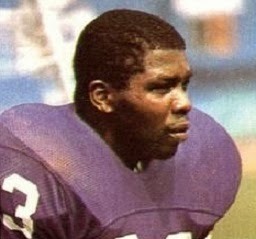 QB Tommy Kramer provided emotional leadership as well as passing ability and FB Ted Brown (pictured above) paced the ground attack. Star DE Doug Martin had been joined by NT Charlie Johnson, who was obtained from the Eagles, and LB Matt Blair had a Pro Bowl year. The Falcons, under Head Coach Leeman Bennett, seemed to be going in the wrong direction. They were an inconsistent team that had been badly beaten in each of their last two regular season games with the offense struggling in particular, having managed just one touchdown in those two contests. QB Steve Bartkowski was a classic dropback passer with a strong and accurate arm, but the deep passing game was lacking. However, RB William Andrews was outstanding at both running the ball and catching out of the backfield. The linebacking corps was the strength of the defense, but ILB Buddy Curry was out for the playoff game with a knee injury. There were 60,560 fans in attendance for the first postseason game at the Metrodome. The Falcons scored at just over a minute into the game when the Vikings were forced to punt following their first series. Punter Greg Coleman fumbled the snap and, while he got the kick off, it was blocked by LB Paul Davis. DE Doug Rogers recovered the ball in the end zone for an Atlanta touchdown. 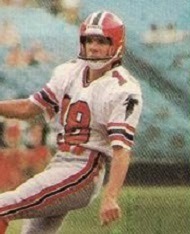 Mick Luckhurst kicked the extra point and the visitors had an early 7-0 lead. Late in the first period, the Vikings benefited from a 25-yard pass interference call on FS Tom Pridemore. It set up a 33-yard field goal by Rick Danmeier that finished off a 33-yard drive in six plays and the score was 7-3 at the end of the first quarter. In the second quarter, the Vikings drove 82 yards in seven plays to put more points on the board. HB Darrin Nelson had a 14-yard run and Tommy Kramer connected with WR Sammy White for a 25-yard gain. The series ended with Kramer again throwing to White for an 11-yard touchdown. Danmeier’s extra point put Minnesota ahead by three. Down by 10-7, a promising drive by the Falcons came up empty when FS John Turner intercepted a Bartkowski pass at the Minnesota two and returned it 17 yards. Minnesota added to its lead with a 30-yard Danmeier field goal in the last 30 seconds before the end of the half that capped a four-play series and made the score 13-7. It was set up by a 20-yard punt return by DB Rufus Bess and helped along by Ted Brown’s 14-yard run. It had been a rough first half for both clubs. Bartkowski had only three pass completion against the tough Minnesota defense, which pressured him relentlessly. 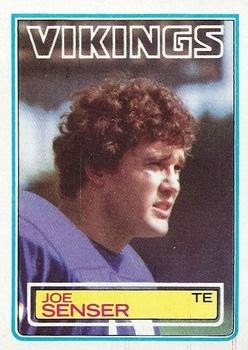 Meanwhile, the Vikings had injury problems as Ted Brown missed time with a sore shoulder and John Turner hurt his ankle to the extent that he was carried off the field and taken to a hospital for x-rays, although both returned to make big plays in the second half. In the third quarter, Atlanta finally put together a solid drive, with Bartkowski completing three passes, including one for 25 yards to WR Floyd Hodge and another to WR Alfred Jenkins that picked up 22 yards. The series reached the Minnesota 17 before stalling and the Falcons lined up for a field goal attempt. However, QB Mike Moroski, the holder, took the snap and sprinted around right end, lateraling to PK Mick Luckhurst (pictured below), who ran the last 17 yards for a touchdown. It was the Englishman’s only career rushing attempt and capped an eight-play, 71-yard possession. Two minutes later, SS Bob Glazebrook intercepted a Kramer pass at the Minnesota 35 and returned it for a touchdown. Despite their woes on offense, the Falcons were ahead by eight points at 21-13. Minnesota drove to another score before the third quarter was over, going 70 yards in 13 plays, ending with a 39-yard Danmeier field goal. Along the way, an offside penalty in a third-and-four situation gave the Vikings a first down and Kramer completed a pass to TE Joe Senser for 18 yards. The Falcons had to punt on their next series and, as the contest entered the fourth quarter, Minnesota responded with a ten-play possession that advanced 61 yards. Brown converted a fourth-and-inches situation with a three-yard run and Kramer completed a pass to WR Sam McCullum for 15 yards. The drive ended with Kramer throwing to WR Sam McCullum for an 11-yard TD and Danmeier again added the PAT to put the Vikings up by two at 23-21. The Falcons moved back in front thanks to a 50-yard, seven-play drive that concluded with a 41-yard Luckhurst field goal with 6:45 left in regulation to make it 24-23. The big play was a Bartkowski pass to Jenkins that picked up 30 yards. The Vikings, taking over with six minutes left in the game, put together a 72-yard drive. Ted Brown was the key player, running for gains of 11 and 10 yards along the way. In addition, Kramer threw to WR Terry LeCount for 19 yards. Brown finished off the series with a five-yard carry that was helped along by a block thrown by HB Rickey Young. The TD put the Vikings in front once more with 1:44 remaining. There was still time for the Falcons to respond, but after advancing to the Minnesota 45, a pass by Bartkowski was intercepted by Turner to seal the win with 57 seconds left on the clock. The Vikings came out on top by a final score of 30-24. Atlanta’s offense failed to score a touchdown, and the Vikings easily outgained the Falcons by 378 yards to 235. Minnesota also had an edge of 30 to 24 in first downs. The Vikings registered the game’s only three sacks and forced two Atlanta turnovers, to one for Minnesota. There were a total of 17 penalties, with the Vikings flagged 10 times at a cost of 84 yards. Tommy Kramer completed 20 of 34 passes for 253 yards and a touchdown, also giving up an interception. Ted Brown ran for 81 yards and a TD on 23 carries. Joe Senser had 6 catches for 81 yards to lead the team’s receivers. Defensively, John Turner contributed two interceptions, with a trip to the hospital in between. For the Falcons, Steve Bartkowski was successful on only 9 of 23 throws for 134 yards and no TDs while tossing two interceptions. William Andrews had 48 yards on 11 attempts and rookie RB Gerald Riggs added 38 yards on 9 carries and was one of three Atlanta receivers who led the club with two catches apiece, gaining 16 yards. Alfred Jenkins had 52 yards on his two receptions and Floyd Hodge gained 29 on his. The Vikings went on to play Washington in the second round and lost 21-7. They dropped to 8-8 in 1983 and went into a period of decline, not returning to the postseason again until 1987. As for the Falcons, the loss to Minnesota proved to be the end for Leeman Bennett, who was fired and replaced by Dan Henning. They had an even longer period in the doldrums, not reaching the playoffs again until 1991.